Ling, a.k.a lemonfish, or cobia (Rachycentron canadum). With their large, triangular dorsal fin, together with their tendency to swim near the surface, adult ling look a lot like a shark. 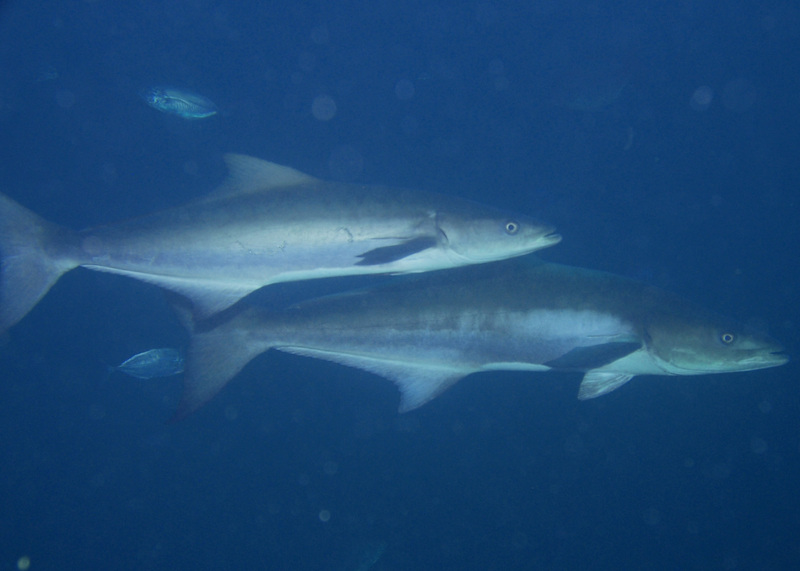 Their shark-like shape, together with their curious nature can be rather disconcerting when scuba diving. On more than one dive I have seen a large shark-like fish approaching rapidly, but thankfully it has almost always been a ling. They will get so close sometimes that you can scratch their backs. Females are usually larger than males, and often have one or more suitors in pursuit. 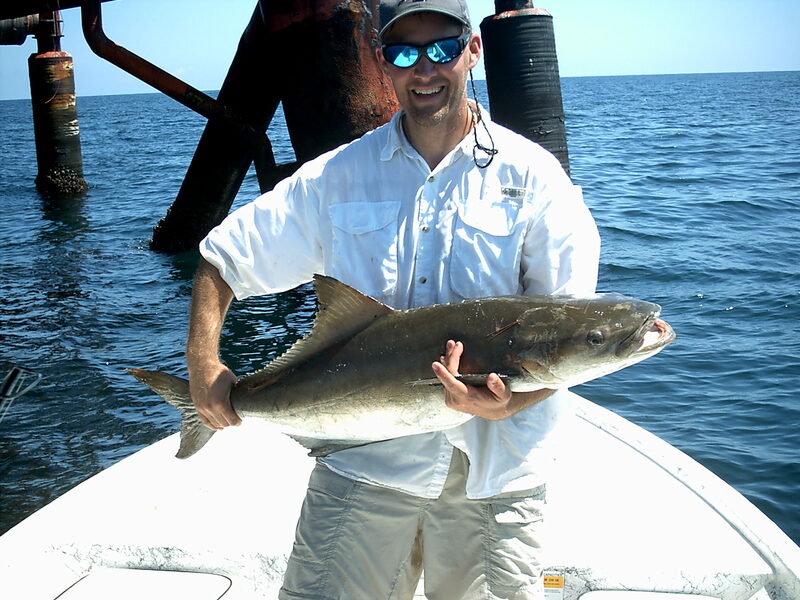 Cobia get big, over 100 lbs! Ling were designed to prefer coastal waters, and they like salinities around 30 ppt, not as salty as average ocean seawater (35 ppt), and not as fresh as the typical estuary. Ling like to hang out around Gulf Coast oil production platforms, and upon approaching a platform, will often be the first fishes to greet your boat. Notice the lower lip extends past the upper, indicating ling were designed to attack their prey from beneath. Note the small sharksucker hitching a ride on this ling’s back. 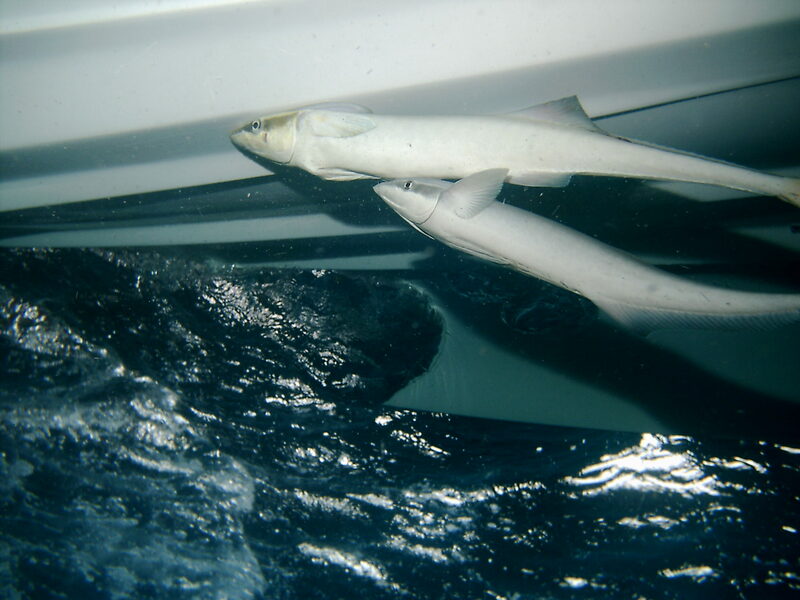 Sharksuckers attached to the hull of my boat. The stripe along the side of their face, along with their general body style, is very similar to a young ling's. Copyright 2005, David E. Shormann. Ling prefer water temperatures above 68 °F (20 °C), and prefer to spawn in waters between 75 and 84 °F (24 and 29 °C). They have extremely high fecundities, and can lay hundreds of thousands to millions of eggs per year. Eggs are small, a little more than 1 mm diameter, and buyoant. They hatch within 24-36 hours, and grow rapidly. Ling grow very fast, plus they taste great, so it is no surprise that commercial farming of ling is on the rise worldwide. Ling reach a marketable size of 10-13 pounds (4-6 kg) in about 1 year. 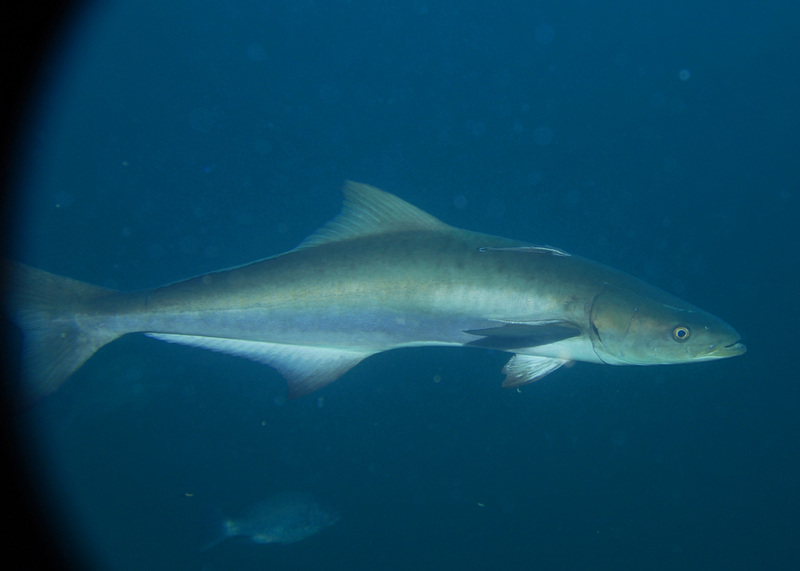 Ling have many other common names, including cobia, lemonfish, and crabeater. They don’t eat lemons, but they do eat crabs, and a fresh blue crab is a good bait for them. Many offshore fishermen like to keep a rod ready with about a 1/0 or 2/0 circle hook and 30-50 lb test line. If a ling is spotted, they will quickly attach a crab or other bait, pitch it towards the ling, and hang on. Sometimes ling will eat almost anything, while other times they are extremely finicky and difficult to catch. As always, before fishing, check your local regulations for ling size and posession limits. I mentioned earlier that ling have a high fecundity, and since the one in the above photo was a gravid female, I decided to estimate the number of eggs she was carrying. Like most fishes, ling have two ovaries, and the combined weight of her eggs was about 1 kg (2.2 lbs), about the weight of most of the fish I’m used to catching! To estimate the fecundity, I weighed two separate and smaller clumps of eggs. The clumps weighed 0.10 and 0.09 g, and had 318 and 326 eggs respectively, which averaged to 322 eggs per 0.095 g. Using this ratio as a conversion factor, I calculated this ling held about 3.4 million eggs! Strong, curious, tasty, big, and extremely productive, ling are an amazing creation enjoyed by millions of people all over the world! There is probably no better place in the world to have an outdoors adventure than Alaska. The Aleut Indians gave it the name “Alyeska” meaning “Great Land”, which indeed it is. With an area almost 2-and-a-half times larger than America’s 2nd largest state, Texas, and a human population only 3% of Texas’, there is plenty of room to roam. In Texas, we have a saying that “if you don’t like the weather, wait 5 minutes”. This is even more true in Alaska, as I have never seen a place with such rapidly changing weather. And I don’t think I have been anywhere with more rapidly changing weather than the first Alaskan place I visited, the Pribilof Islands. The Pribilof Islands are composed of two inhabited islands, St. Paul and St. George, and several smaller islands. 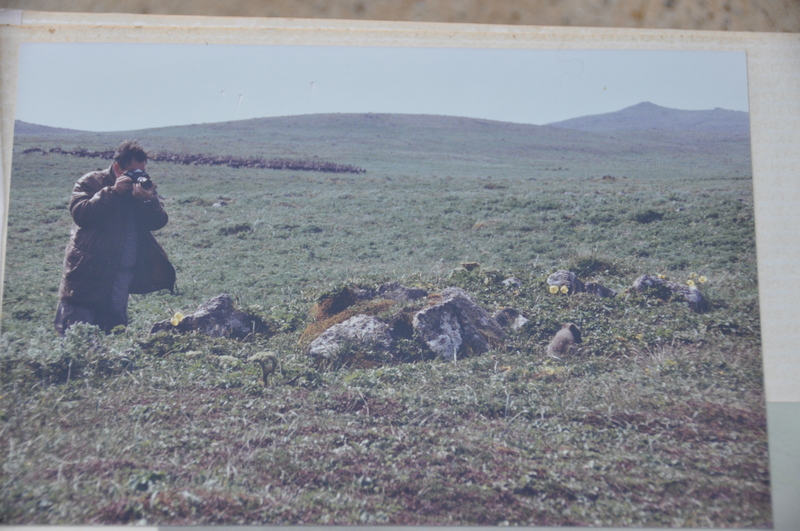 A common saying on the islands is “”This is the only place in the world where you can experience all four seasons in one hour.” I arrived on St. Paul Island in July 1992 as part of a scientific team studying the local ecology. I was a graduate student at the time, working on my master’s degree in marine science. 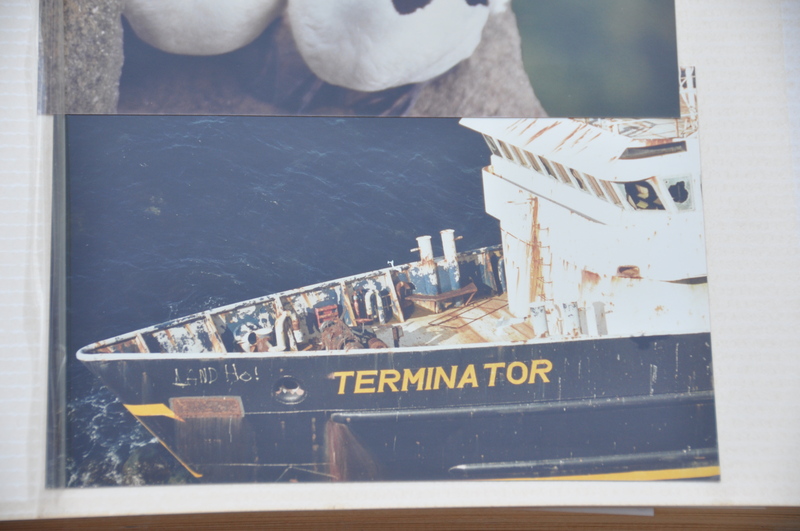 My advisor, Dr. Terry Whitledge, had worked extensively in the Bering Sea and knew the area well. Whether researching Texas bays, the Mississippi River Plume, or the Bering Sea, his ability to organize and head up an expedition never ceased to amaze me, and this was no different. At a time when the economy of the former Soviet Union was collapsing, Dr. Whitledge had organized this research project, consisting of the two of us and 5 excellent Russian scientists who probably desperately needed some cash. Dr. Michael Flint (right), and another Russian scientist heading out to sea to do research. While the Russian scientists did not have access to the same array of high-tech tools we had, they made up for that with their knowledge of plants and animals in the area. The Russians were my first experience with people that I would truly call “naturalists”. Up until my master’s degree, all of my education and employment was engineering-related. I started working at General Dynamics in 1989 on the then-secret Navy A-12 project, but the project was canceled in 1990, and everyone was sent back to the main office to work on the F-16 Falcon. I could see the writing on the wall, and after lots of thought and prayer, decided to pursue a master’s degree in Marine Science. The University of Texas’ Marine Science Institute in Port Aransas was searching for graduate students, and I wrote them a rather silly letter about how I wanted to be a “fish conservationist”. Dr. Whitledge liked my engineering background, and while I never directly studied fishes, I couldn’t have asked for a better advisor or a better area of study (water quality). Providence led me down the best path, and I started in August of 1990. That December, General Dynamics released everyone with 5 years experience or less (which would have included me), and I was sad for many of my friends who lost their jobs. When I started my master’s degree, I had little experience with biology or even science. Engineering is more deductive, where you apply rules in new situations to build things. Science is more inductive, and is about finding rules. And my master’s research focused mainly on water chemistry and a single algal species responsible for creating a “brown tide” in local estuaries. A love of the outdoors and fishing led me to naturally learn the names of many of the birds and fishes of the Texas coast, but until I met the Russian scientists, I had never met people who were so incredibly gifted and knowledgeable about everything in the ecosystem they were studying. They knew more than just the fish and birds; they could identify practically anything, from the largest whale to the smallest plankton. They loved the ecosystems they studied. In the book of Genesis, one of the first things God tells Adam to do is name the animals (Genesis 2:19-20). I think one reason God did this was to help Adam care for the animals. One of the very basic ways we care for other human beings is by knowing their names. It is rude and inconsiderate to call out “hey mister” to a person we have known for a while. Not only that, it shows ignorance and a lack of concern. In the same way, if we do not know the names of any of the creatures God has made, it is easier to not care about them. The Russian scientists taught me a great lesson in the importance of being a naturalist, and this is something I encourage everyone to do, especially children.I think that training children to be naturalists is an extremely important part of their education. In government schools, evolution is emphasized in high school biology, and too much time is wasted teaching this ridiculous theory. Rather than lowering a teenager’s already fragile self-esteem by telling them they evolved from monkeys and that they are products of random chance, it would be far better to teach them about the local flora and fauna and their responsibility to care for it. Students that are more familiar with their local environment are more likely to care about it. But until government schools in America, Russia, and elsewhere start teaching children they were created in God’s image and have a unique purpose, children are much better off learning at private Christian schools or in home schools. I had many adventures on that first trip to Alaska. The flight from Anchorage to St. Paul was an adventure in itself. Climbing aboard a Reeve-Aleutian Airlines Lockheed Electra, I noticed the date of manufacture stamped on a bulkhead. I do not remember the exact date, but I do remember that it was before my birth year (1965). I was used to flying in large passenger jets, and getting into this 4-engine turboprop that was older than me was a bit unsettling, but it performed flawlessly, and a few hours later the pilot made a nice landing on the dirt runway in St. Paul. The next big adventure was driving with one of the Russian scientists, Yuri, from the airport to the house we had rented, which doubled as our research station. Come to think of it, driving anywhere with Yuri was a bit of an adventure. Yuri was in his late 40’s, but had never driven a car. However, he was fascinated with the 13-passenger van we had rented, and he insisted on driving it everywhere. He actually drove pretty well, but his main problem was that he overcorrected, a typical characteristic of inexperienced drivers, and this always kept us hanging on to the seats a little tighter than normal. More than one adventure has been terminated by an unexpected run-in with the Pribilof Islands. Conducting research in the Bering Sea around the Pribilof Islands was amazing. We hired a local captain, an Aleut Indian with a Russian name, Timon Lestenkof. The uninhabited Pribilof Islands were discovered in 1788 by the Russian explorer Gavriil Pribylov. Soon after, Russians forced Aleuts Indians from the Aleutian chain (several hundred miles south of the Pribilofs) to hunt seal for them on the Pribilof Islands.Today, the Pribilof Islands are home to the largest Aleut Indian community in America, and many of them make a good living through fishing. Timon was a wonderful man who had served America in Vietnam. He would take us just about anywhere we wanted to go, provided it was close enough for him to pick up the island on radar, a distance of about 10 miles. This was in the days before GPS was in widespread use, which would have made navigating around the island and beyond much easier. We would collect water samples from various depths using “Niskin bottles”, and use the winch to raise and lower them. We would also tow plankton nets and store the samples. 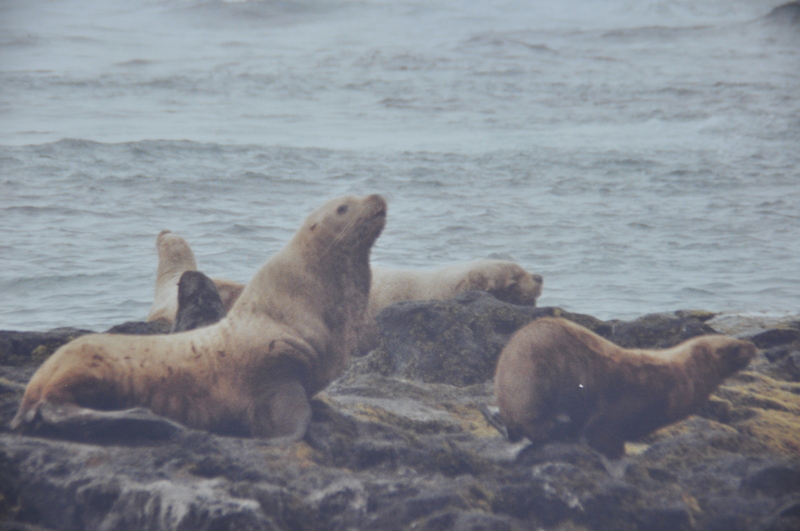 Northern fur seals would come and visit us while we conducted research, as would fulmars, gulls and kittiwakes. While waiting for us to collect water samples, Timon would sometimes fish. One time I watched in amazement as he tore a 3-inch chunk from an orange-colored rubber glove, threaded it on a hook, and proceeded to catch several 15 to 30 lb halibut. Timon had a painting in the wheelhouse depicting Christ standing behind a sailor, directing Him through a storm. On more than one occasion, the fog set in while we were at sea, and we had to rely on instruments to direct us back to the harbor. The Russian Orthodox church was the lone church on St. Paul, and while I don’t agree with some of their teachings, I am still glad they trust Christ for their salvation. And I was glad that Timon trusted God that our instruments were right and wouldn’t send us crashing into a cliff or a shoal in the foggy weather, which they never did. 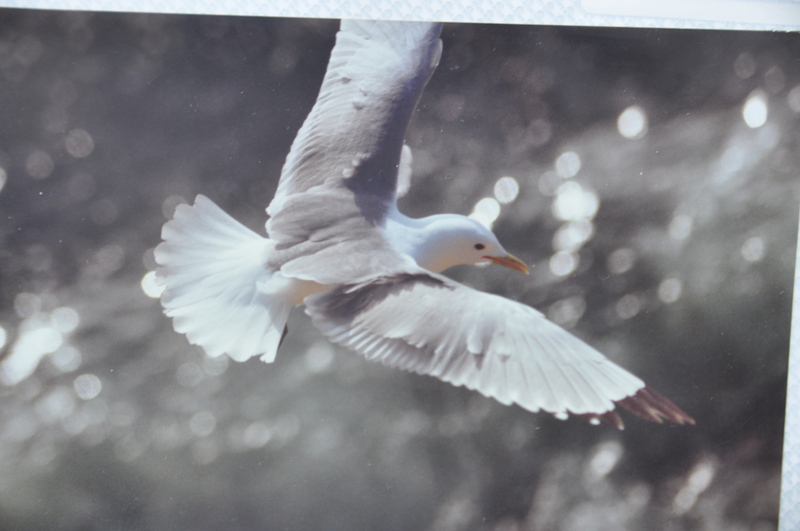 One of my favorite parts of research on the Pribilofs was catching seabirds for Dr. Sasha Golovkin. My main job was to perform chemical tests on the water samples we collected, but due to the extreme weather conditions, we often had to wait for days before we could get out to sea. So when I could, I helped the other scientists with their research. I would travel with Dr. Golovkin to the cliffs where millions of seabirds nested, and we would catch and weigh puffins, murres, auklets, anything we could catch. 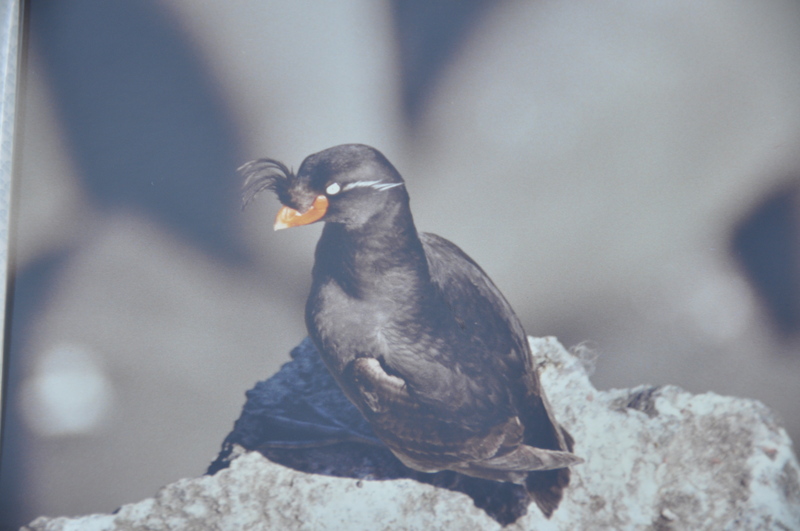 Dr. Golovkin was particularly interested in least auklets, which the locals called “chuchkis”. Dr. Golovkin was studying their diet and metabolism. About the size of a sparrow, chuchkis would fly out to sea in large flocks to catch small crustaceans called copepods. The chuchkis lived along rocky shorelines, and built their nests in the crevices of rocks. In the evening, the chuchkis would return to the rocks, and we would hide behind large boulders, and when a group of chuchkis would come by we would swing large nets into the sky and capture them. Most of the birds were released immediately, but some were kept for further observations. Dr. Golovkin would sample their stomach contents, and they would invariably be full of one species of copepod about the size of a rice grain. Like freshly cooked crabs or shrimp, the copepods also changed from their natural opaque coloration to a pinkish-red color, the heat from the chuchki’s body in essence “cooking” the copepods. 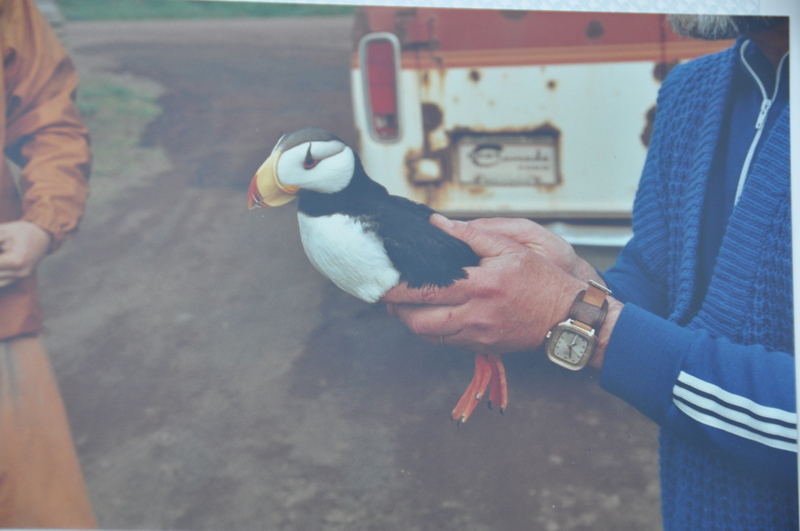 Dr. Golovkin holding a horned puffin, Pribilof Islands. 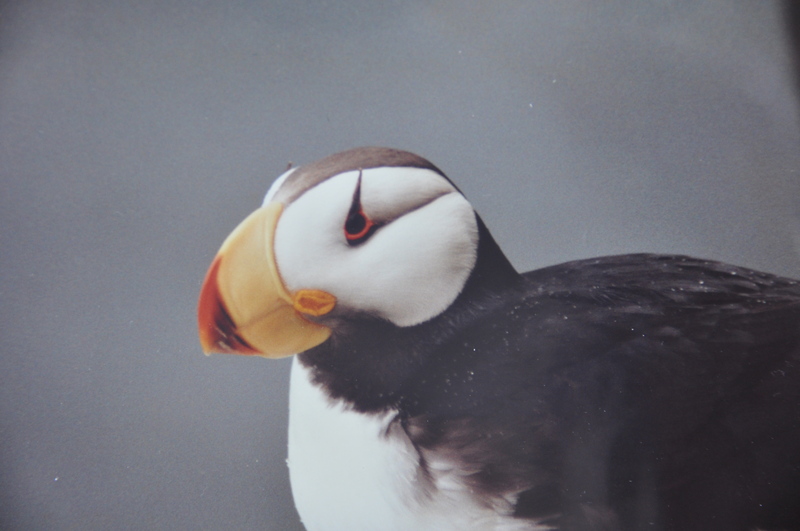 Chuchkis, like puffins and other auklets, were able to “fly” underwater. Denser than most birds, the majority of the chuchki’s body was submerged underwater when swimming on the surface. Dr. Golovkin built a 5-foot square holding tank to observe the chuchkis swimming, and we were all amazed at the ease with which this tiny bird moved underwater. It had to be incredibly agile to catch the small copepods that were its primary food. We spent many hours exploring the island. There was a 500-head herd of caribou, and one time I spooked them and sent the whole herd stampeding in front of me, inches from the front of the ATV I was driving. We saw many ships hopelessly wrecked on the beaches, along with whale carcasses. 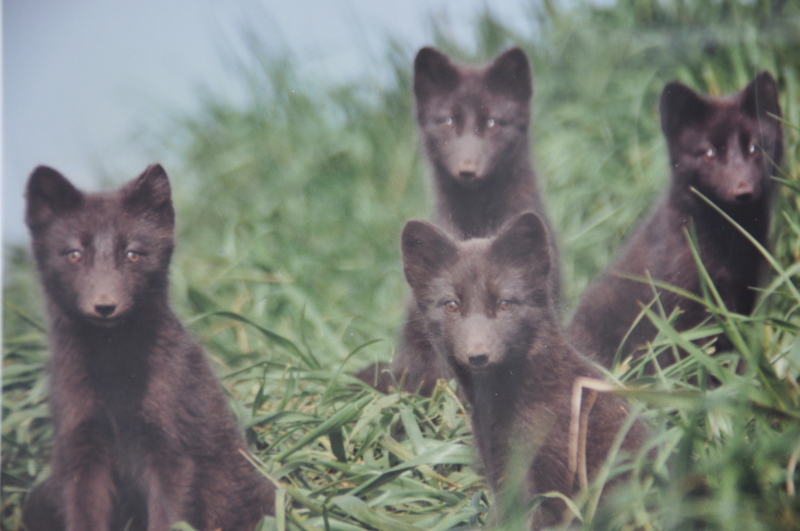 Snowy owls, arctic foxes, and of course, Northern Fur Seals inhabited the island as well. The Pribilof Islands are the summer calving grounds for approximately 500,000 fur seals. Almost every beach had fur seals on it, some more than others. In prime spots, there were tens of thousands of seals. The males would form a “harem”, consisting of 1 male and a group of females and their pups. At the larger rookeries, the sound, and the smell were incredible. I could sit and watch the seal pups for hours, playing and interacting with one another. With such an unbelievable amount of animal and bird life, the Pribilof Islands were one of the most beautiful places I’ve ever visited, and highly recommended, if you can stand the smell. Dr. Flint photographing a baby Arctic Fox. Note the caribou herd in the background. 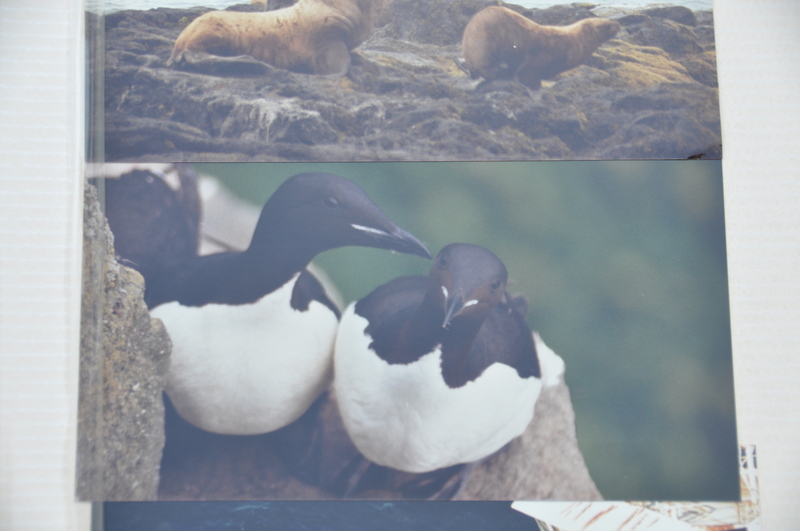 Pribilof Islands. 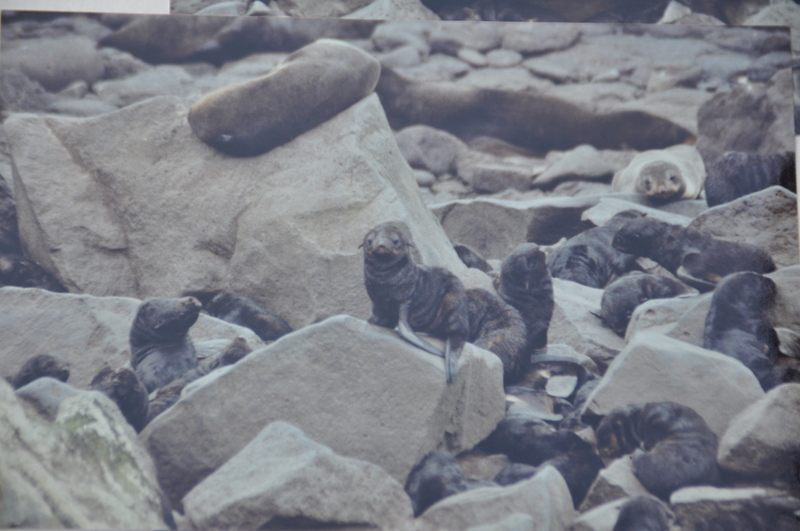 Baby Northern Fur Seals. Larger, lighter brown seals are mothers. 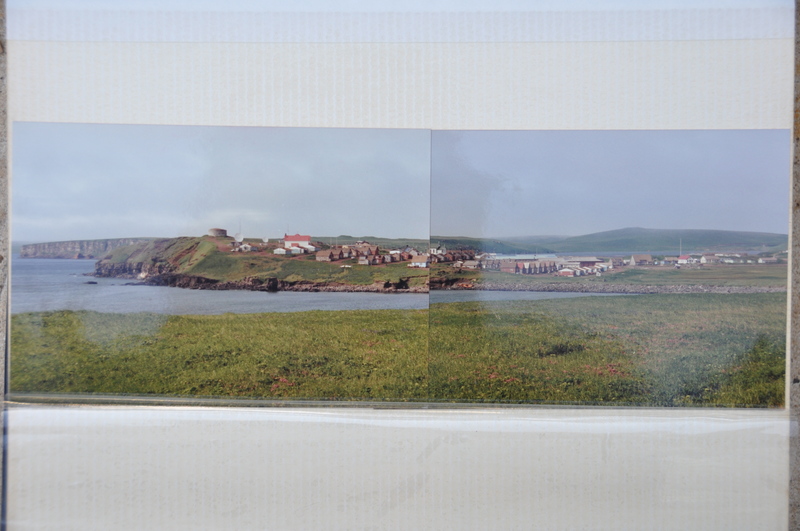 Pribilof Islands. 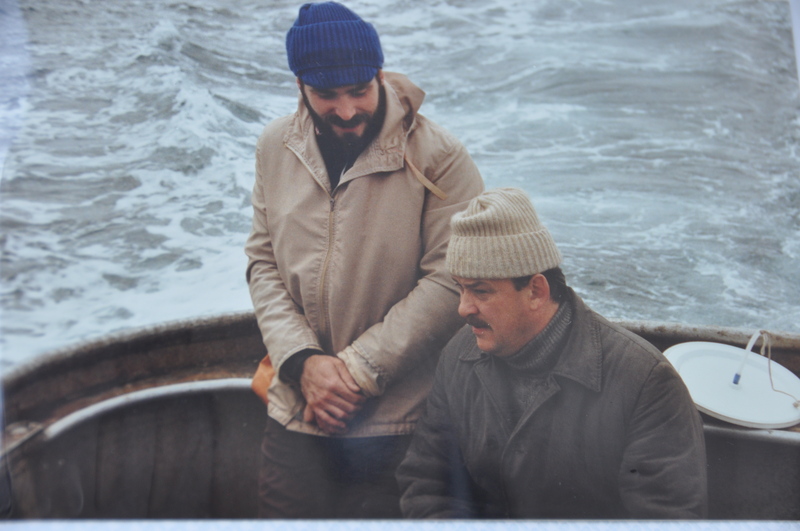 Research continued on the Pribilof Islands in the summer of 1993, and I was also able to experience a bit of the mainland and its world famous salmon fishing opportunities. Before I left for the Pribilofs that summer, my father and I .made a fishing trip to the Kenai Peninsula. Our destination was the Kenai River and a guided trip for king salmon. While the majority of Alaska is devoid of people, the Kenai River in late July is not one of those places. Known worldwide for the incredible size of its king salmon, the Kenai River is probably the busiest river in Alaska. If you are looking for pristine wilderness, the Kenai River is not the place to be, but if that doesn’t bother you, then it is a beautiful place with lots of fishermen. We failed to catch a king salmon on our trip, although one of the men in our boat did land a beautiful 50 pounder. The Kenai River also sports one of the largest sockeye salmon runs in the state, and anglers flock to its banks for this tasty prize. Since sockeye are very reluctant to strike a lure, fishermen must basically “snag” the salmon in the mouth with a streamer fly. Occasionally they do strike a lure or fly, but most sockeye are caught by snagging them in the mouth. I managed to hook a few, but my tackle, which was meant for light-tackle speckled trout and redfish in Texas bays, was no match for the combination of powerful fish and strong current. Those two summers on the Pribilof Islands, and the time spent reading about Alaska, had me hooked for life, and I was determined to make it back to this great land. Besides the wildlife, there were other features about Alaska that intrigued me as well, such as the mountains, volcanoes, and glaciers. Alaska seemed to have everything an outdoors enthusiast could want, and in 2000, I was able to return again with my father. As a young boy, my father would take me fishing, and before long, I was passionate about it. Growing up in Kingwood, Texas, I would ride my bicycle several miles to the San Jacinto River and fish for catfish and bass. My love of fishing seemed limitless, and I pestered my hard-working father to no end, constantly wanting him to take me fishing. 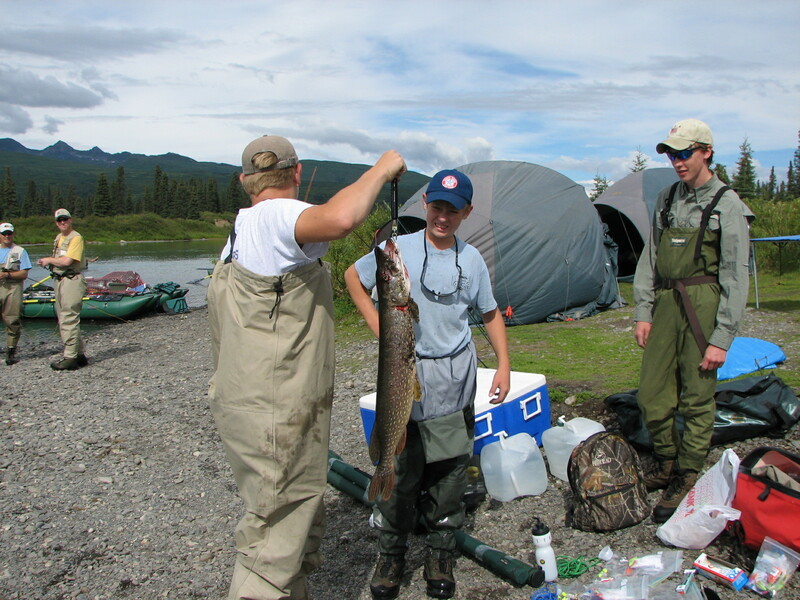 I am now more reasonable about the amount of time and effort I put into fishing, but I still love to go, and my second fishing trip to Alaska in 2000 is one I will never forget. On this trip we decided to head to the west side of Cook Inlet to fish for silver salmon. It was early August, and the silvers were beginning to show. We were on a guided trip with Talon Air Service, and took a float plane to fish the Kustatan River. The river was high and muddy from recent rains, and the fishing was slow. Growing up fishing the spring run of white bass on the Trinity River, I knew that the bass would stack up in clear sloughs and creeks when the Trinity ran high. I had noticed that we traveled down a clear slough to get to the Kustatan, and suggested this as a possibility. We returned to the slough, and immediately began catching silvers almost as fast as we could get a line in the water. We had our limits in short order. The next day we had a halibut trip scheduled, but it was canceled due to rough weather. We decided to try again for silvers, but this time we fished a spot where Wolverine Creek emptied into Big River Lakes. We had great success with silvers again, but more than that, we were treated to front row seats of a mother grizzly bear catching salmon for her two cubs. This was the 2nd wild grizzly bear I had ever seen, and my first Alaskan grizzly. Little did I know that it would not be my last. 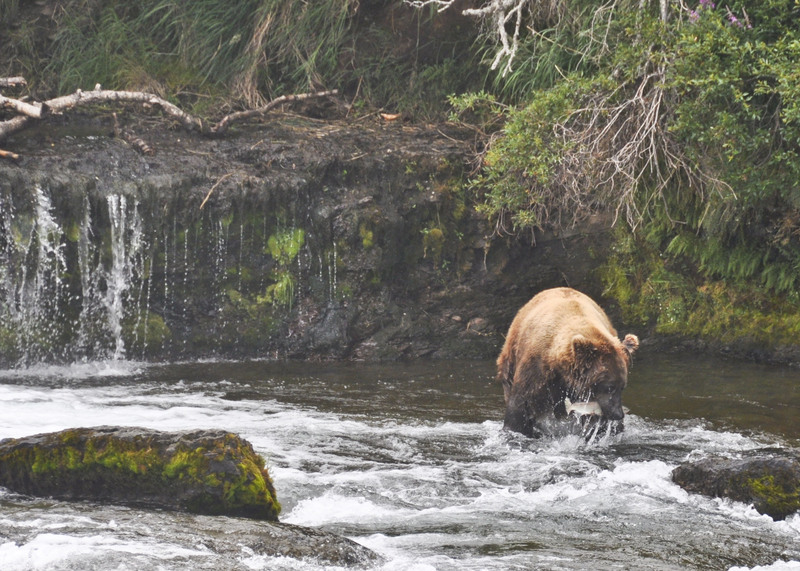 Sockeye salmon were stacked up beneath the outfall of Wolverine Creek, and the mother grizzly had easy pickings. When a large male black bear came on the scene, the mother grizzly bear chased him up a steep incline. We simply could not believe how an animal of that size could move so quickly up something so steep. Wolverine Creek was a fascinating place, and after we had caught our limit of salmon, I persuaded the guide to let me out of the boat to get some pictures of salmon swimming up the creek. Several people cautioned me about the mother grizzly being nearby, but I could not see it and proceeded upstream. There were at least a dozen boats fishing in the area, and the mother grizzly seemed perfectly at ease, so I was not too apprehensive about hiking up the creek. Suddenly, someone spotted the mother grizzly bear heading towards the creek, and everyone started yelling at me to come back to the boat, but I could not hear them because of the rushing water. It was not until I saw my guide approaching and waving his hands that I realized I needed to get back. The bear kept approaching, but it never charged or seemed concerned about my presence on the creek. This was my first experience that convinced me of the fact that all wild grizzlies are not ferocious man-eaters. 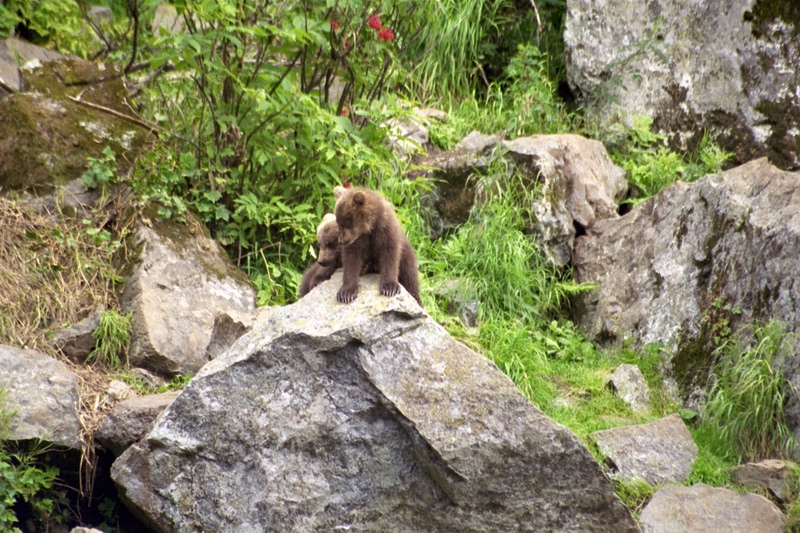 I took more photographs of the mother grizzly bear and her cubs than of anything else that trip. As I photographed the bear, I couldn’t help but think about Thomas Mangelsen’s photo I had seen back in 1989. That photograph was such a perfect trinity of bear, salmon, and photographer. 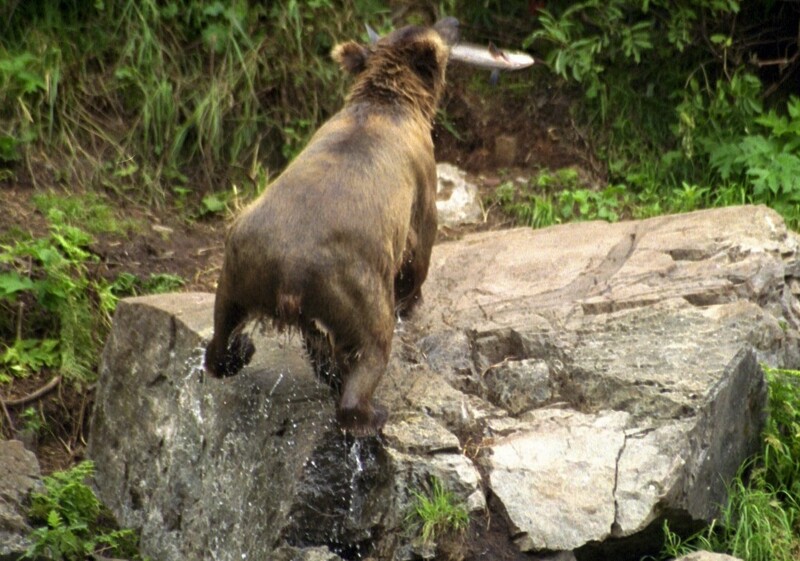 It revealed the incredible abilities of all three, the bear and its hunting prowess, the salmon and its ability to leap up and over a rushing waterfall, and the photographer’s ability to have the camera settings optimized for the occasion. The bear I was photographing had a different hunting technique than the Mangelsen bear, and would “snorkel” and then dive down about 6 to 8 feet to catch its prey. And while I knew I would not get any photos like the Mangelsen bear photo, that snorkeling bear provided plenty of opportunities for photography practice, and made me realize more than ever that I wanted to be around these magnificient creatures and the salmon streams they loved. 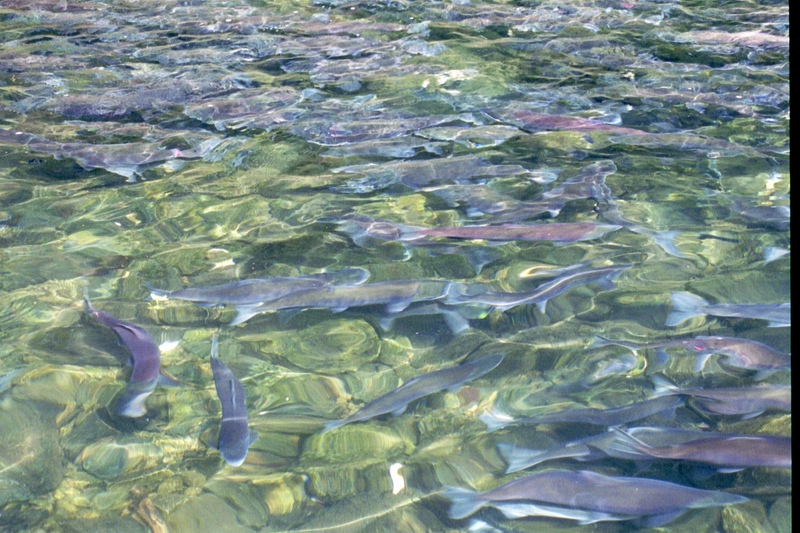 Sockeye Salmon congregating at the outflow of Wolverine Creek. Cubs' mother returning from her snorkeling trip with a sockeye. After returning home from the 2000 Alaska trip with my father, I spent hours looking over the photos I had taken, longing to return to Alaska. Flying on the float plane, as well as observing the huge number of aircraft flying in and out of the Lake Hood float plane airport in Anchorage, made me realize that to get “off the beaten path” in Alaska, I would need to either go by plane or by boat. Since 1997, I had been conducting Marine Science Camps in Port Aransas, and the thought occurred to me that I should attempt an Alaska Science Camp. I discussed the plan with Rob Sadowski, a former student-turned-camp-assistant, and he couldn’t agree more. By the summer of 2001, my beautiful wife Karen, and I owned two math and science education businesses, we were homeschooling my 15 year-old son, Kenny, and we were the proud parents of a daughter born in June. When Christ said He came to give us an abundant life, He wasn’t kidding, and mine was getting more abundant by the minute. I knew though that for some reason exploring Alaska figured into the picture of this abundant life, and I was determined to find out how. I am a Christian, and I am in awe of God and His creation. One of His works that I am particularly in awe of is the grizzly bear. The father of the classification system, Carolus Linnaeus, originally classified it as Ursus arctos in 1758. Many “new” species were identified afterwards, but now all are classified again as Ursus arctos, with two subspecies, the Kodiak bear, Ursus arctos middendorffi and Ursus arctos horribilis, which includes all other grizzly bears. I saw my first grizzly bear in 1989 in Yellowstone National Park. Fresh from graduating with a B.S. Degree in Aerospace Engineering from The University of Texas, I was taking one last family vacation before fulfilling my responsibilities designing military aircraft at General Dynamics. We were staying at the Yellowstone Hotel on the shores of Lake Yellowstone, and heard rumors that a mother grizzly bear was feeding on spawning cutthroat trout in a stream near the hotel. We went out to inspect, and sure enough, there stood a mother grizzly bear about 100 yards in the distance. A Yellowstone Ranger had the formidable task of keeping about 100 tourists behind an imaginary line he had drawn. With a Nikon N70 35 mm camera and 300 mm zoom, I hoped to grab a few photos of the bear. The light levels were a bit low for my lens, but I did manage to at least capture the bear and one of her two cubs on film. That first grizzly bear fascinated me, and I have been enthralled by them ever since. I watched in amazement as the mother bear would jump out of sight down into the creek bed, and then suddenly, up would come a cutthroat trout, flying through the air and onto the bank. The cubs would then proceed to pounce on the trout and devour it. I watched this scene repeat itself several times. That first encounter with a wild grizzly bear left a lasting impression on me, and I hoped it would not be my last. Another lasting impression on that trip to Yellowstone came in the form of the photography of Thomas D. Mangelsen. We were in Jackson Hole, Wyoming one day and visited his art gallery in town. The photograph that became permanently etched in my memory was one of a grizzly bear the split second before it closed its jaws on a leaping sockeye salmon. I would learn later that this photo was not taken at Yellowstone, but at Brooks Falls in Katmai National Park. The photograph made me realize two things, the importance of salmon to grizzly bears, and the incredible hunting skills these bears possess. To be able to catch a salmon with its teeth while holding its position against a torrent of whitewater seemed like an almost impossible blend of concentration and agility. One thing I noticed on that first grizzly encounter is there are two kinds of people; those wanting to get closer to grizzly bears, and those wanting to stay as far away as possible. That day, I discovered I am of the former persuasion, much to the dismay of friends, parents, and my lovely wife, Karen. And while I do like to get as close as possible to bears, I don’t want to be a fool, and two things I will always do when in bear country are 1) make every effort not to surprise a bear and 2) Make any bear that shows even the slightest interest in me or my campsite feel very unwelcome. In 1975, the U.S. Fish and Wildlife Service listed Yellowstone grizzly bears as a threatened species under the Endangered Species Act. 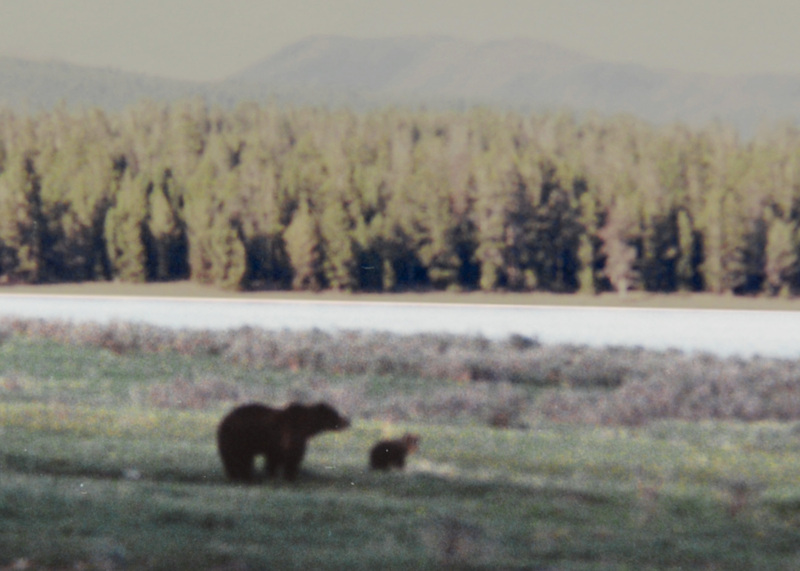 However, with the combination of good management practices and abundant food, Yellowstone’s grizzlies came off the threatened list in March of 2007. But how did they get on the threatened list to begin with? In 1800, there were an estimated 50,000 grizzly bears in the lower 48 states. By 1975 only 1000 remained. The massive decline of grizzly bears was primarily a result of ignorance on the part of American settlers combined with a love/hate relationship with grizzlies. Just the mention of the name “grizzly bear” is enough to get an emotional response from the average person. The early settlers loved grizzly bears as a food source, as well as a source of profit through the sale of skins. In California, “Bear grease” was a sought after lubricant for greasing wagon wheels. Bears were also hated, especially by livestock owners. In his 1881 book, Reminiscences of a Ranger, Major Horace Bell recounted that in the 1850’s, “grizzly bears were more plentiful in Southern California than pigs”, and were so numerous in some areas they made cattle ranching nearly impossible. Worst of all, grizzly bears killed humans. Lewis and Clark, in their famous journey through the American West at the dawn of the 19th century, described how the “Indians [gave] a very formidable account of the strength and ferocity of this animal, which they never dare to attack but in parties of six, eight or ten persons; and are even then frequently defeated with the loss of one or more of their party.” One 1852 report from California stated that “schools were closed because it was unsafe for children to use trails”. The rifle gave men a sense of strength they never had before, and I think in many cases they failed to realize just how well it was working. Technology has a way of instantly replacing skills that used to take months, if not years, to acquire. Digital cameras are a great example. Excellent photos used to take great skill, with bulky and expensive equipment. Now however, someone with almost no experience can pick up a digital SLR and start shooting fantastic photos. This is a good example of technology, because it allows more people to capture beautiful images, but it also forces professional photographers to take their game to a higher level in order to offer something truly unique and original. Guns are another good use of technology, unless of course they are put in the hands of a fool. For someone looking to defend his household, feed his family, or protect his country, guns are a useful weapon. However, put in the hands of a fool, a gun can be a dangerous tool. I feel sorry for people who live in countries that do not give their people a right to bear arms, but I am also glad I live in a country that doesn’t allow fools to carry guns. And just like a digital SLR in the hands of a novice, the Sharps rifle allowed instant access to skills that used to involve much greater danger and more time to develop. Instead of building skill and knowledge about grizzlies first, many ignorant people used technology as an excuse for pragmatism, thoughtlessly and needlessly killing many grizzlies. I think the same thing happens today, and we have all been guilty of replacing skill and knowledge with ease of use, whether its overharvesting a fishery with no thought of maintaining a balance, or a young person overusing a calculator without first memorizing their basic math facts. Technology is a gift from God, and we need to use it to improve our abilities to rule His kingdom, not to destroy it and ourselves. The removal of grizzly bears from the lower 48 states followed the Westward expansion; the last grizzly bear in Texas was killed in 1900, the last in California in 1922. Although currently extirpated, the grizzly bear is still California’s state animal and adorns their flag. Trophy hunters also took their fair share of grizzlies during the late 1800s and early 1900s. I am not a hunter, but I am a fisherman, and while I do enjoy catching a large fish, my main goal when fishing is not to go on a “trophy quest”, but rather to enjoy God’s creation and bring home some good tasting fish for dinner. While there are a few trophy hunters that have self-esteem issues and have a need to conquer something more powerful than themselves using an extremely unfair advantage, I think most of them are simply in awe of the animals they pursue, and they want to put the animal to some use after killing it, whether that use be food or decoration. But no matter what the use, the main issue is that it is a limited resource, and unless someone has a reasonable estimate of how many animals are alive, it is impossible to know how many can be hunted while maintaining the population. Some people have a hard time with the idea of “limited resource”. I have noticed this mostly with the boys on my adventure camps. In their immaturity and naivety, I think boys tend to believe that they are “the only ones” who have walked the land and rafted the rivers we are on, and therefore, they are free to take as much as they want. Unless we are short on food, I follow the Alaska Dept. of Fish and Game regulations, and in some instances go above and beyond their expectations. I do not believe in wasting the resource, and we do not keep the allowed number of salmon “just because we can”. We only keep enough for the campers to eat in one night. I also encourage the use of barbless hooks even when it is not required. Most of the fish we catch on a trip are going to be released, and this is fun to be able to do, but it is extremely detrimental to the fish when it gets hooked in a way that the barb does considerable damage. You lose a few more fish with barbless hooks, but the damage to the ecosystem is considerably less. In hunting though, the goal is to kill the animal, and there is no “catch and release” like there is in sport fishing. This makes it even more important for somebody or some group to have a population estimate of the species being hunted. To understand the importance of population estimates, consider for example a certain small pond, small enough to throw a stone across. If no one knew how many people were fishing and how much they were catching, it would be easy to catch all of the fish in a short amount of time. This is basically what happened in North America with the near extinction of the grizzly bear. No one had a good estimate of how many bears there were, and no one knew how many bears were being killed each year. There were some famous bear hunters such as Ramon Ortega from California, who reportedly killed 200 grizzlies in his career and 15 in one day. For the most part though, few records were kept, and it was the love of hunting grizzlies, combined with the ranchers’ and other humans’ hatred that led to their demise in the lower 48. I am also a proponent of using the plants and animals God created for our purposes. This is what God intended, but he also told us to “rule over” His creation. We can be good rulers or bad rulers. People have a hard time being good rulers, especially when it comes to something like grizzly bears. While grizzly bears have many opponents, there are those who want them for their parts as well. 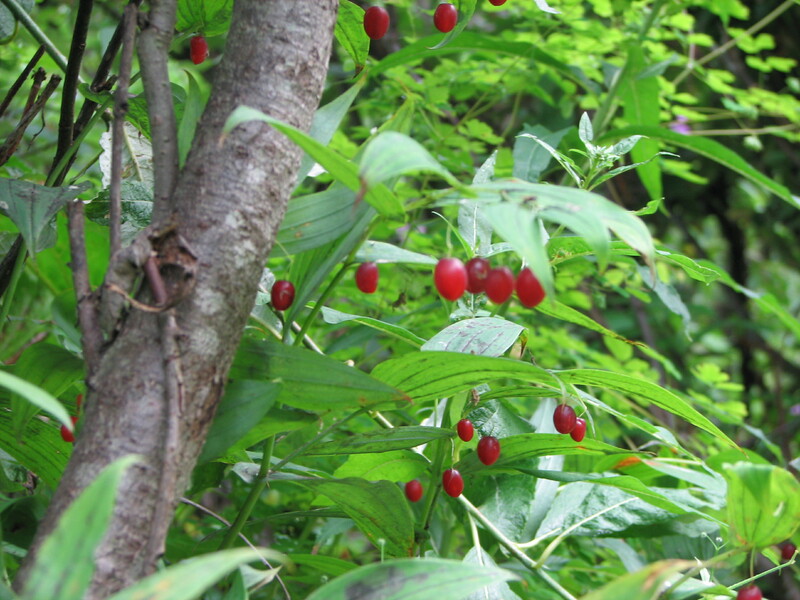 For example, the bile from a bear’s gall bladder has been used for medicinal purposes in China and other Asian countries for thousands of years. I do not know much about the use of bear bile in medicine, but if it is truly helping human beings, then I think hunting bears for this purpose should be allowed as long as it doesn’t destroy the bear population. Many places currently permit the sale of gall bladders taken from hunted bears, including Nova Scotia and Maine. If more places permitted the sale of bear parts, it may actually curve the tide of poaching and black market trade that occurs. Also, it may help to eliminate the cruel “bear farms” that exist in some Asian countries, where bile is extracted directly from live, caged bears. Taking bile from a bear is NOT the same thing as taking milk from a cow or eggs from a chicken, and is a very cruel and painful process for the bear. Other parts of the bears can also be sold. I am all for using plants and animals to cure ailments, but if humans can find a less destructive method, then we should do that. Since the Japanese synthesized bear bile in 1955, it seems like killing bears just for their gall bladder is not a worthwhile pursuit. Current estimates of prices for bear gall bladders vary anywhere from US $30 to $3,000, and not being a bear gall bladder expert, it is difficult to say which price is more realistic. Ironically to some, hunters were probably the reason grizzlies did not become completely extinct in North America. Although often stereotyped as bloodthirsty savages, more often than not hunters are some of the best conservationists around. One of the best hunter/conservationists was America’s 26th President, Theodore Roosevelt. Roosevelt was an avid hunter of many animals, including grizzly bears. But he also loved bears and wanted to make sure future generations would enjoy them too. He set aside more land for national parks and preserves than all of his predecessors combined, 194 million acres (785,000 km²). Roosevelt explained, “There is an intimate relation between our streams and the development and conservation of all the other great permanent sources of wealth.” During his presidency, Roosevelt promoted the nascent conservation movement in essays for Outdoor Life magazine. Roosevelt believed we should find a balance between use and conservation of our natural resources. A Christian man, Roosevelet understood the meaning of taking dominion, and realized that America’s future depended on it. But he also understood there was a proper way to do this, one that included the Christian principle of unity and diversity. The Trinity, and the “body of Christ” are two of many examples of unity and diversity in God’s kingdom. The concept can be applied to many situations, including resource management. One place, like a forest for example, should have a diversity of uses, and we should learn how to properly care for and use such places. God did not give us His creation to plunder and destroy, but rather to manage and enhance. Roosevelet saw forests as places to protect, but he also saw the benefit it would provide if timber were harvested. Instead of making large tracts off limits, Roosevelt encouraged the efficient use of the resources. I think Roosevelt would be appalled at the current state of affairs regarding oil and gas production in the Alaska National Wildlife Refuge and other places. This is a perfect place to show that man and animals can coexist. Although we have failed miserably in the past with destructive mishaps and polluting practices, man has also learned a great deal about how to properly mine for oil and gas. One amazing fact is that even though there were hundreds of oil and gas platforms in the path of Hurricane Katrina, there was no significant loss of oil from that storm. No beaches were soaked with crude oil, no oil soaked birds to clean, no fish kills from oil. Even the recent BP Macondo disaster was not as bad as predicted, and was stopped in 1/3 the time of the Ixtoc spill of 1979, even though the BP spill was over a mile deep, while the Ixtoc spill was only 160 ft. down. This is really quite amazing, and is a testimony to just how far we have come regarding oil spill prevention. Nevertheless, thanks to Roosevelt and others, the grizzly bear did not go extinct, and its numbers are currently increasing in the lower 48 states. In March 2007, the grizzly was removed from “threatened status” in Yellowstone National park, and now over 500 live in the park. Established in 1872 under Ulysses S. Grant, Yellowstone was the first national park in America’s, and the world. Setting aside tracts of land as parks “for the benefit and enjoyment of the people” was not a new concept, but no park had ever been created of such a vast size that also had the purpose of providing “for the preservation from injury or spoliation of all timber, mineral deposits, natural curiosities, or wonders within said park, and their retention in their natural condition” as stated in the 1872 Act establishing the park. Yellowstone has been a huge success, and millions of visitors flock there annually to see not only bears, but wolves, bison, elk, and countless other natural wonders. Grizzly bear populations are on the rise in other places as well. While only receiving about 20,000 visitors annually compared to Yellowstone’s millions, Alaska’s Katmai National Park is home to more grizzlies than any of America’s national parks. More than double the size of Yellowstone, the current grizzly population is around 2,500. 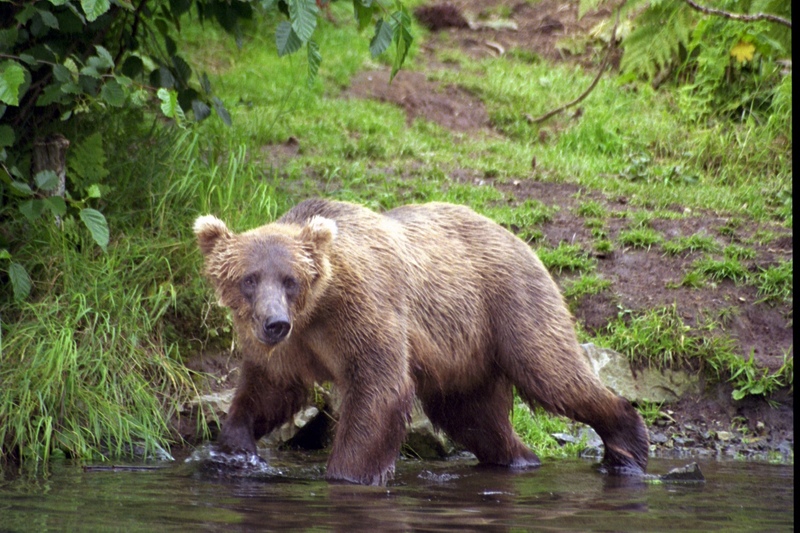 Alaska has the most grizzlies of any state (32,000) and more than all of Canada (22,000). Russia, however, takes the prize for most grizzlies, with current estimates around 70,000 to 80,000 bears, and most of these living in the eastern half of Russia, an area roughly the same size as the United States. Poaching and other illegal hunting activities still affect bear populations worldwide, but overall their numbers are on the increase. And with human populations also on the increase, the number of grizzly/human encounters is only going to go up. So will we start killing bears off again? I don’t think so. I think the attitude towards bears and most wildlife is different than it was in the 1800s. We have lost some animals, such as the passenger pigeon, that people loved dearly, and we almost lost many other great animals, such as the bald eagle, whooping crane, and bison. These have been humbling experiences, and people are more concerned now than ever to have wild places for animals to run free. So how do we deal with more bear/human encounters? How do we better manage bear populations? Well, probably the best way is through education, and that is part of the goal of this book. Through the setting of a rafting/camping adventure in Katmai National Park, you will learn what it means to humans to have wild places, and you will learn a lot about survival in the wild and what it is like to live in close contact with hundreds of grizzly bears. You will experience some of the raw beauty of Katmai National Park and other parts of Alaska, and you will learn the importance of taking dominion of His creation. With that said, let the adventure begin! Adult dolphins reach lengths up to 12 feet (4 meters), and males are normally larger than females. Dolphins typically live 20-30 years, but have been known to live up to 50 years. Bottlenose are dark gray on top, fading to white or pink underneath. An average sized (550 lb) dolphin will eat 20-50 pounds of fish each day! Dolphins find fish to eat using sight, but they can also hunt at night and in murky water by using echolocation. When a dolphin uses echolocation, it is basically creating a picture of its environment using sound. Although dolphins produce a range of sounds, the most useful sounds for echolocation appear to be clicks of short duration released in single pulses or trains of pulses. These clicks may be repeated up to 800 times per second. Dolphins have no vocal chords, so the sounds they produce are believed to be created by forcing air through their nasal passages and nasal sacs. The bulbous head of the bottlenose is filled with fatty tissue, and is believed to act like a lens, concentrating the clicks into a “beam” of sound. Their sounds can travel over half a mile, and they can even use their sounds to stun prey. So not to confuse outgoing sounds with returning sounds, outside sounds enter through the lower jaw and travel through the skull by bone conduction. Fat and oil bodies within the lower jaw vibrate, adn the sound is channeled directly to the middle ear. The hearing center in a dolphin’s brain is well-developed, probably so that it can analyze and interpret returning sound messages. For comparison, a human ear can hear in the range of 16 to 20,000 vibrations per second. A bottlenose dolphin responds to frequencies above 150,000 vibrations per second! A dolphin’s vision is not as good as human’s, and it is believed they have no sense of smell, but they can taste. Dolphins reproduce sexually, and like all mammals, give birth to a baby that feeds on its mother’s milk. Dolphins have an 11-month gestation period, with babies being born mainly in the spring. Dolphins swim in groups or pods of related dolphins, and work together to trap fish, squid, and other food items. Sometimes they jump for no apparent reason! While the dolphins in these photos and video are jumping, they also like to dive, and have been recorded to dive to depths of about 1,000 feet (300 m)! They have a horizontally-positioned caudal fin, which they move up and down for propulsion. This is different than in fishes, which move their vertically-positioned tails from side to side. A rigid dorsal fin and a pair of flippers are used for stability and turning. Dolphin’s skin is smooth and slippery, allowing them to attain speeds up to 25 miles per hour (16 kph). The Marine Mammal Protection Act forbids harassing, feeding, or interfering with a dolphin’s normal activities. Sometimes, their “normal” activities include being extremely curious and approaching humans within just a few feet. If you visit the Gulf Coast, you may not be greeted by a dolphin in such a personal way, but if you are, turn the boat motor off, keep out of the water (dolphins may bite), and enjoy the show!